The pursuit of trout in New Zealand is viewed as national birthright. Anyone with a valid angler's licence may fish New Zealand lakes and rivers. New Zealand is fortunate that all of its natural lakes and most of its rivers and streams have public access along their margins. To gain access across private land requires the landowners consent; generally this is not withheld, however anglers, as a courtesy and to avoid misunderstanding, should obtain permission. Once on the water, the angler is free to roam countless miles in search of trout, adventure, free of charge and without hindrance. With water so pure that it is often described as 'gin clear', easy public access and plentiful fish, the region is an angler's paradise. Southern rivers have long provided wonderful trout fishing not only for local anglers but also for the many visitors from around New Zealand and overseas. They travel to our region to test their skill in some of the best brown trout fisheries in the world and to fish for rainbow trout in the spectacular mountain streams. Our region abounds with numerous quality fishing rivers, streams and lakes. In fact, from Invercargill, Southland's capital city, there are 27 excellent fishing rivers and streams within 2 hours easy driving. From Gore, The World Capital of Brown Trout Fishing, it is only an hour's drive to these fishing spots. The Mataura river is arguably the best flyfishing river in the world. There are numerous unique features that differentiate our freshwater fishing from the other fishing regions within New Zealand. These include: Seclusion and tranquility, natural surroundings. Easy and good access to clean, clear water; wild trout hatchery (rather than farmed trout), large number of trout in good condition with low density of anglers and a high probability of catch; a wide choice of fishing experiences in a small geographical area and a range of challenges from beginner to advanced level. Selection of fishing techniques which can be used. All these favourable factors lend to memorable fishing experiences. Rainbow trout can be fished for in the rivers and lakes of the Southern Lakes area but it is the quality of brown trout fishing which gives the South its deserved world wide reputation as one of New Zealand's premier fishing destinations. Many respected anglers have suggested that anyone can catch a Rainbow trout but it takes real experience to land a Brown trout, as they are a particularly wily fish and provide a real challenge. Some of the best salmon angling waters in New Zealand are found in the South and each year visitors as well as locals take advantage of the many angling opportunities the region has to offer. From the Waitaki river north of Oamaru, to the Taieri near Dunedin, the mighty Clutha in South Otago, or around to Lakes Te Anau and Manapouri, salmon can be found. Fishing guides are available throughout the region; they are experts in their field and often mean the difference between a memorable day's fishing or one that might end in disappointment. It is their aim to provide you with enjoyment and satisfaction in your quest. Fishing is a relaxing sport and is ideal for a family fun day. Short, as well as season licences, are available and can be obtained along with fishing gear and knowledgeable advice at stores throughout the friendly South. Remember that when fresh water fishing, you need a fishing licence. These can be downloaded from www.fishandgame.co.nz. A series of informative pamphlets on fishing opportunities in the Otago Southland regions are available from information centres, sports stores and Fish and Game offices in Dunedin and Invercargill. Otago and Southland contain a myriad of rivers, streams and lakes making it a fisher's paradise. Trophy fish abound and with so many places to choose from, you're sure to find a secluded river with your own stretch of water to fish. Fantastic fishing spots can be found wherever you are in Otago and Southland. North of Dunedin, the Waitaki District houses 3 hydro dams on Lakes Waitaki, Aviemore and Benmore. All three lakes and the nearby rivers and streams provide fantastic fishing in scenic surroundings. Omarama, in particular, is famous for its superb fishing opportunities. Near Lake Benmore and numerous rivers and streams, anglers can pick and choose the ideal fishing conditions for their favourite fishing methods. A local fishing guide will make your trip all the more worthwhile as they know the best fishing spots! The best fishing is to be had in the early morning/evening and later in summer, night fishing is productive. *Salmon fishing can be found in the Waitaki River from February to April. Fish from 5-10kg are common with occasional large fish up to 15kg. Specialist equipment is required and visitors are recommended to contact a guide to make the most of this fishery. The Dunedin City Council currently stock 3 areas of water in Dunedin to provide good fishing without having to travel far away. They are open for fishing all year round. Fly fishing and spinning are the fishing methods allowed; bait fishing is also allowed at Tomahawk Lagoon only. SULLIVAN'S DAM at the top of the Northern Motorway is set in native and some exotic pine forest. The southern end is deep but gets shallower near the inflow. It is stocked with brown and rainbow trout and has a limit of one fish per day. SOUTHERN RESERVOIR is deep with shallow areas around its western bank. It is a great place for picnicking and walking as well as fishing. It is stocked with rainbow trout but some brown trout migrate to the reservoir. The limit is one fish per day. TOMAHAWK has two lagoons but only the top one is stocked with fish, these being rainbow and brown trout and perch. The lagoon used to be tidal but is now permanently closed off from the sea. It is also quite shallow with a maximum depth of 1.5m. The fish are fast growing with loads of food, such as perch fry, bullies and aquatic insects to feed on. Fishing is best here during winter, spring and early summer. The limit is one trout per day and as many perch as you like. Bait fishing is very successful here. Salmon can be found in the CLUTHA and TAIERI rivers from January to April. Lowland, coastal lakes in Otago, WAIHOLA, WAIPORI and TUAKITOTO contain perch and brown trout set amidst wonderful scenery and birdlife. Lake Mahinerangi contains brown and rainbow trout and perch. All fishing methods are allowed. The SHAG and WAIKOUAITI RIVERS are smaller but contain clear water for easy fish spotting. The season is open from 1 Oct - 30 April for both rivers. Both rivers contain brown trout, with the Waikouaiti River containing sea-run browns as well. All fishing methods may be used. MANUHERIKIA RIVER contains brown and some rainbow trout. The best method appears to be fly fishing fish they spot in the water, but all methods may be used. The fishing season is open from 1 Oct - 30 April. There are many small streams and rivers in the Catlins and fly fishing and spin fishing are recommended for the upper and lower reaches of most of these waterways. The lower reaches have seasonally abundant food sources for trout so check out a fishing guide as to the best time to go. The Matau branch (true left) of the CLUTHA RIVER has the best fishing, especially in summer, with spin and bait fishing very popular. Fly fishing is also productive. 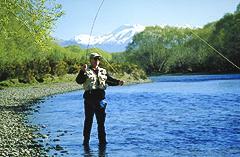 The Clutha River also provides the opportunity to catch Sea run and resident brown trout. Quinnat salmon are in the river from January. LAKES MONOWAI AND HAUROKO are large lakes where trolling is the most popular technique. Shore based fishing can also be productive off stream mouths. The lakes contain large brown and rainbow trout and both have a boat ramp. 1or 2 huts are located around Lake Monowai for those wanting to camp out. LAKES TE ANAU AND MANAPOURI include populations of brown and smaller populations of rainbow trout. Atlantic and quinnat salmon are also present but in much smaller quantities. BORLAND STREAM is a large stream, lined with bush and restricted to artificial baits only. Fly fishing is the best method to use here. It contains 2-3kg brown trout and some rainbow trout also. LILLBURN STREAM is large and clear with good access. The lower reaches carry the most fish with brown trout up to 1.3kg. All fishing methods can be used, with fly fishing the most popular. WAIRAKI RIVER is medium sized and braided lower down with some good pools to fish in. It contains mostly brown trout but rainbow trout also live here. The upper reaches may only be fished using artificial bait but all fishing methods are allowed further down. ORAUEA RIVER is another medium sized stream that joins the Waiau. Brown trout dominate but rainbow trout are also present. HAMILTON BURN Small stream, long slow moving pools, easily waded 0.5-1.5kg brown trout Fly fishing, spinnig Froth line, pools. Fishing in the Southern Lakes region provides an idyllic, scenic experience. With plenty of sun all year round and an amazing backdrop of snow-covered mountains, fishing here will appeal to all anglers. Whether you prefer the solitude by a rippling mountain stream or a trip to a lake with the family, the Southern Lakes Region has it all. POOLBURN DAM is on the Ida Valley side of the Rough Ridge Range. It is used as a storage area for irrigation water for land on the floor of the Ida Valley. It contains medium - large brown trout; the last rainbow trout was caught in 1953. All methods of fishing can be used, with fly fishing and spinning giving good results. Submerged rocks make trolling difficult but can give good results if there is a breeze on the water's surface. The season is open from 1 Oct - 30 April and bag limit is 6 fish. UPPER MANORBURN DAM is at the southern end of the Ida Valley and has 14kms of shoreline ensuring a great fishing spot will be found for all anglers. Contrasting to Poolburn Dam, the Upper Manorburn Dam is mainly a rainbow trout fishery; the last brown trout was caught in 1948. Fishing is open from 1 November to 31 May. All fishing methods may be used and there is a site to launch boats. Early in the season, worm fishing is best, especially in close to rocky areas. Trolling is good throughout the season. The lower basin of the dam is deep with some shallow areas (McGoverns Bay) while Greenland reservoir is shallow. Bag limit is 6 fish. LAKE ONSLOW was named after William Hillier, Fourth Earl of Onslow who was also a Governor of New Zealand. It is located just before Roxburgh amid high tussock grassland and was first used as a water supply for gold mining and irrigation. The lake sustains a considerable population of 1-1.5kg brown trout, and you may be lucky to get a 3kg fish. There is a boat ramp for extensive exploration of the lake and all fishing methods can be used. Trolling, spin fishing, worm and fly fishing are popular choices and most prove profitable. In late January/early February, cicadas hatch and this proves to be a lucrative time for fishing. Fishing is allowed year round and the bag limit is 6 fish. LAKE DUNSTAN, located beside Cromwell, was formed when the Clyde Dam was developed on the Clutha River and covers 26 square kilometres. The most productive part of Lake Dunstan is the Clutha Arm, accessed off State Highway 6. Brown and rainbow trout and quinnat salmon can all be found here. Situated at convenient points around the lake are barbeques and picnic tables to provide scenic rest stops for lunch and are usually also good fishing spots. Boat ramps are dotted around the lake also. Trolling, Harling, Spinning, Fly fishing and Spinning are the recommended forms of fishing on Lake Dunstan due to the aquatic weed beds of Lagarosiphon major. (Clean weed off boats and gear before moving to another waterway). However, all fishing methods may be used. LAKE WANAKA is a glacial lake, 180 square kilometres in area and at its maximum, greater than 300m deep. The Matukituki and Makarora Rivers are the major tributaries. The lake contains populations of brown and rainbow trout and Chinook salmon. Wanaka is a superb holiday destination and is sure to provide some fantastic fishing opportunities. The lake has easy access to the water with boat ramps at various spots on the lake. Trolling is a very popular method on Lake Wanaka, and spinning, fly fishing and bait fishing also produce good results. Harling, is likely to prove a popular choice of fishing also. This lake is restricted to artificial baits only. LAKE WAKATIPU is another large glacial lake, being 80km long and can be over 300m deep in places. It also sustains populations of brown and rainbow trout and Chinook salmon. Lake Wakatipu is located alongside Queenstown, a beautiful holiday and adventure town. With magnificent mountain scenery and plenty of sun, the fishing is bound to be great. Brown trout are the most abundant species in Lake Wakatipu, and it takes approximately 2 hours to catch a fish. Trolling is again the method of choice and is the most successful method for catching salmon. Harling also gives very good results, while spinning and fly fishing can also be successful. LAKE HAWEA, another glacial lake also contains brown and rainbow trout and quinnat salmon. All fishing methods may be used. Early morning and late evening are excellent times for fishing on the lake. BUTCHER'S DAM near Alexandra is easily accessible, containing small-medium brown trout and perch. All fishing methods are allowed. CONROY'S DAM also near Alexandra, contains brown trout and also freshwater crayfish (koura). All fishing methods are allowed. FALL'S DAM contains brown trout and also brook char in the headwaters. These fishing sites are irrigation dams built to collect and store water for irrigation during the summer. All fishing methods may be used at all sites. EGLINTON RIVER is a medium sized river in Fiordland National Park. It is easily accessed and can be readily waded and can only be fly fished. Brown trout are the main species, although rainbow trout maintain an active presence. The best months to fish are from November through to May. LAKES GUNN and FERGUS are two small rarely fished lakes containing large brown and rainbow trout. Trolling, spinning and fly fishing from boats are recommended. HOLLYFORD RIVER is a medium sized river well suited to the experienced angler.